The first real pic of a reference Nvidia Kepler GK104 based GPU’s PCB has emerged online at PCINLIFE Forums. A few hours ago we detailed a sketch of the PCB along with the power connectors positioning here. The PCB shown here holds the GK104 chip which has also been seen for the first time, The GK104 chip is bare from the center with a heatspreader on its side. The PCB holds a total of 8 Memory chips which suggest a 256-bit memory bus and a 2GB memory buffer. Power connectors either include 2 x Six Pin or 1x Eight + 1 x Six Pin connector stacked in one spot, Additional space for another 6 Pin connector can also be seen. Furthermore we see 2 SLI Gold Fingers which can allow upto 4 Way SLI Multi GPU configuration (Something we missed on GTX560TI/GTX460). Display panels include a Full Length Mini Display Port, HDMI and 2 Dual DVI ports. 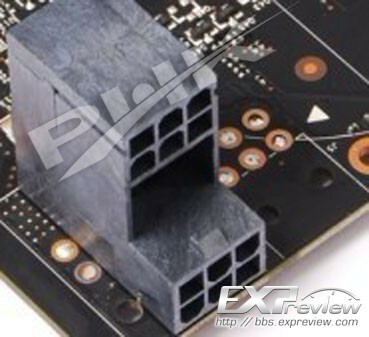 The Power connectors have been stacked in one place so that the cooler can accompany larger fans to reduce thermal loads, TDP of the card is suggested around 300W. From the pic you can also notice the VRM/Power Area and a two pin + 3 pin connector to power the fans.